If you have ever bought a life insurance policy, you know that many insurance companies often require a physical examination and that that examination frequently includes obtaining a urine sample. One thing insurance companies look for in that sample is cotinine, a metabolite that is an indicator of the presence of nicotine in the body. If the level of this substance is high, the insurance company knows you are a smoker or are exposed to significant secondhand smoke. As a result, you will likely be charged higher rates for your policy. Inhaled nicotine,whether by direct smoking or through secondhand smoke, metabolizes similarly in humans, cats and dogs. 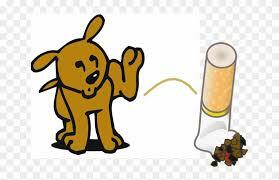 Just as in humans, cotinine can readily be detected in the urine of both dogs and cats exposed to secondhand smoke. As a result, we know that small dogs who spend a good deal of time in the laps of their smoking owners may have cotinine levels equivalent to that of the smokers themselves. Cancer, respiratory disease and heart disease. The list of pet maladies caused by exposure to secondhand smoke sounds a bit like those anti smoking commercials showing people suffering from the horrific consequences of smoking. As a veterinary oncologist concerned about the health and well-being not only of my patients but of my clients as well, please consider this evidence and think about what you can do to reduce your pet’s exposure to environmental tobacco. 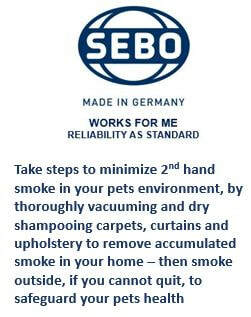 For example, if you are struggling with quitting, at least take some steps now to minimize the presence of secondhand smoke in your pet’s environment. Steam clean your carpets, curtains and upholstery to remove accumulated smoke from your home. Bathe your pet to remove any residue from her fur. Once you’ve cleaned everything and everyone, smoke outdoors away from your pet to prevent the re-accumulation of smoke on your pet and in your home. Especially remember not to smoke while cuddling your pet in your lap or while driving with your pet in the car. The good news is that we know if you stop smoking, the damage from cigarettes abates with time, so let’s hope decreasing your pet’s exposure to secondhand smoke does the same. But better yet, use the compelling scientific information that I have shared with you here to quit smoking for good and protect the health of your beloved pet —and your own as well. For some reason, we all have this idea that dogs should be natural swimmers and love the water. However, this is not true. Not only are dogs not natural swimmers, but some breeds are not physically built for water. Why is it that ACL injuries in dogs is the most common orthopedic injury is all of veterinary medicine? Did nature not make this ligament strong enough in dogs? Is it due to bad breeding or are there other factors in play here with relation to this injury? ​​One would think that by shaving a dog with a very thick coat, that it would help it to be cooler in summer – wrong!